Need advice about a specific Hyundai Sonata problem? Chart based on 71 repairs. See TSBs and recalls for the 2015 Hyundai Sonata. Chart based on 38 repair trips. The repair cost chart excludes repairs made under warranty, do-it-yourself repairs, and repair trips that include maintenance. 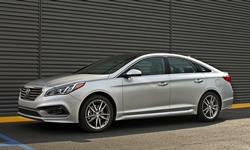 See repairs for all Hyundai Sonata model years. 3720 mi AC quit working. It needed a part that had to be ordered and was out of stock. 20700 mi Steering wheel wobbled side to side. Dealer installed a new steering column. No more issue. 35000 mi Car experiences extended turnover and sputters to life periodically in cooler weather. Took to dealer and they couldn't find anything and said no TSB's on issue. 63000 mi Resistor for radiator fan failed, was replaced Seat switch control panel clip broke off. Part replaced. 27280 mi Sun roof wind deflector came off on highway, needed to be replaced. Dealership was painfully slow at getting replacement part. 45880 mi Noisy panoramic sunroof. Side rails replaced and it appeared to correct the issue. 15000 mi Some SiriusXM channels in the 300's would cut out. Took it to the dealer and they said that they found a low signal coming from the antenna. They replaced it, but I'm still having issues. 19000 mi The moon roof has been rattling and shacking. Had it in 3 times for the same issue. They said there was a recall, but it's still doing the same thing. 24000 mi Took the car in numerous times for a bad vibration in the panoramic moon roof. After the 4th time, they finally agreed to replace it. It was in the shop for about a week for the repair. There is still a slight vibration, but definitely not as bad as it was. I'm just wondering if after about 12 months, the bad vibration doesn't reoccur. 45000 mi Drivers power seat motor failed. Replaced under warranty. 42000 mi Parking brake light was intermittent. Replaced defective part. 42000 mi Vehicle would lag if acceleration attempted. Bad module replaced. 78000 mi CVVT seal not seated properly during assembly. Known issue. Causes slight rpm rev when idling and stutter at speed. 28000 mi The camshaft timing sensor cover seal was breached due to sub zero temperatures and oil leaked on the sensor. This caused a low power condition and check engine light. There was a backorder for the part. Jan 2017 TSB issued to update the drivetrain software. Took about an hour at the dealership and afterwards the vehicle had much better throttle response at lower RPM. Also, shifts feel "crisper". 4000 mi Minor creaking with glass sun roof. Dealer made a few adjustments and all's good. 35800 mi The "cam Sensor" failed causing the engine to run poorly. 41540 mi blind spot detection and rear motion sensing not working. problem with wiring harness. may have been accident related. dealer fixed under warrantee. 8680 mi The noise continues from the sunroof and the dealership has not been able to repair it. They gave the car back after applying grease which stopped the noise temporarily but as soon as the grease dried up the squeaky noise started again. 8680 mi The car is at the dealership since October 5, 2015. Now the cluster has failed along with the squeaky noise in the sunroof. The dealer says they do not have parts and waiting from Hyundai Canada. Update: cluster fixed while at dealer. 8680 mi Never fixed the sunroof. Hyundai ultimately replaced the car. 1300 mi Car hesitated, sputtered and lost power. Dealer could not initially diagnose cause. Hyundai engineers became involved. Replaced engine wiring harness which resolved issue to date. 5000 mi Ventilated driver's seat was not circulating air properly. Dealer found misaligned air vents from factory and realigned them. Works fine now. 41900 mi Original tires had worn down to 4.5mm, and needed replacement. Purchased and installed a set of OE tires. 15000 mi mystery metal piece fell out of driver side mirror. Dealer replaced mirror since they didn't know how to repair or what the piece does. 3720 mi Due to the accident early this year, the body shop replaced the front suspension and stabilizer bar and strut, but there was constant noise coming from the front. The dealer ordered new parts and changed the above mentioned parts. 2500 mi Panoramic sunroof rattled and creaked on bumpy roads. A dry silicone lubricant was applied to gaskets Panoramic sunroof seal was being pulled down into the roof when roof was closed. 7700 mi Moon roof squeak. They applied lubricant, which worked for a while, but the squeak has since returned. 5500 mi seat motor binding. part backordered Tires out of balance since new. Have had 9 tires replaced, 2 of them still unbalanceable. Pending response from Hyundai on different brand of tire. Currently Hankook Kinergy. Requested different brand that will balance properly Shift shock when coming to a stop. Transmission computer reset and problem resolved. 11000 mi Chronic snapping noise from panoramic sunroof. Told that it cannot be fixed. Excessive valve clatter unless I use premium fuel. Unable to fix because there is "no error code" It's starting to look like Hyundai makes it very difficult for dealerships to get reimbursed for troubleshooting problems. 7800 mi Shift shock again when stopping. Reset shift parameters and resolved problem. required Engine Computer update. No problem before, but car feels much faster. Panoramic sunroof noise again. New part available but dealer doesn't know about it, so no part replaced. Weather stripping lubed again which helps temporarily but will need to be done over and over again. 32000 mi Occasional power loss while accelerating. Engine stumbles and looses power. Happened 4 times so far over the past 5 months. Unable to be diagnosed, as no check "engine light" Shift shock recurring when coming to a stop. Reset AT parameters. Resolved issue until it returns. No check engine light. Backup camera failed. Replaced camera. 33000 mi Rattle from right front door with bass notes. Dealer replaced woofer. Rattle still there. Will followup at next visit. Heater blower motor making whining noise. Dealer ordered new blower motor. To be replaced at subsequent visit. C $200 Engine knock. Erratic idle. Fuel induction service & throttle body cleaning. 39240 mi Hybrid system warning message. 49900 mi Hybrid battery cooling system tank leaking. Replaced under warrantee. See our lemon odds and nada odds page to see vehicles with no repairs or vehicles with more than three repairs. To see how frequently 2015 Hyundai Sonata problems occur, check out our car reliability stats.